We are welcoming the Australian tasks created by Adi Nur Cahyono, lecturer of mathematics education in Indonesia, in Brisbane. In an interview, he will give us an insight into his task idea “The Wheel of Brisbane”. If the speed of the wheel is 16 km / h, how many seconds a person in the capsule can reach the top of the wheel since the capsule departs from the lowest part of the wheel? What is the task about? 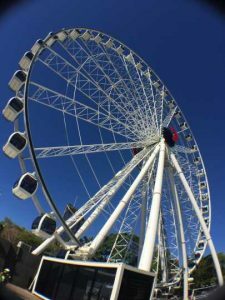 This task is about the application of congruence concept to measure the height of the Ferris wheel located at the south Bank of Brisbane. This is then combined with the application of the concept of time and velocity. This task intends to show that there are several things in the object and how it works that are related to mathematical concepts. Mathematical concepts can be used to determine when a person can reach a certain position on the wheel. Of course, this is not so important to know, we just want to enjoy the wheel. But it can be analogous to know the working of other objects that are similar, for example: windmills, car wheels, etc. But in general, choosing a tourist object to learn mathematics is a good and interesting thing. What are your further plans within the MathCityMap-project? My plan, and also my responsibility, is to expand the implementation of MCM in Indonesia and several countries in Asia and Australia through cooperation with universities. In Indonesia, implementation needs to be extended to other islands outside Java. Not only expansion of its implementation, I plan to develop it continuously, because technology develops and changes continuously, and implementation in different places also requires new innovations. Still connecting and working with MCM Team and being part of the MCM Team is an award for me.